These open stretch racks, which can be constructed on one or two sides, are particularly suitable for archiving smaller to medium-sized collections of a range of technologies. 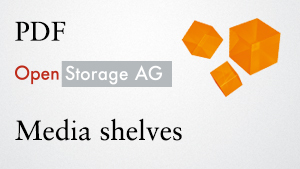 In addition to these shelves, there is also an insert unit that doubles the storage capacity. The multimedia racks with sliding elements are designed for medium-sized to large collections. All of these space-saving shelving systems allow clear archiving in a data processing centre, even in the smallest of spaces.